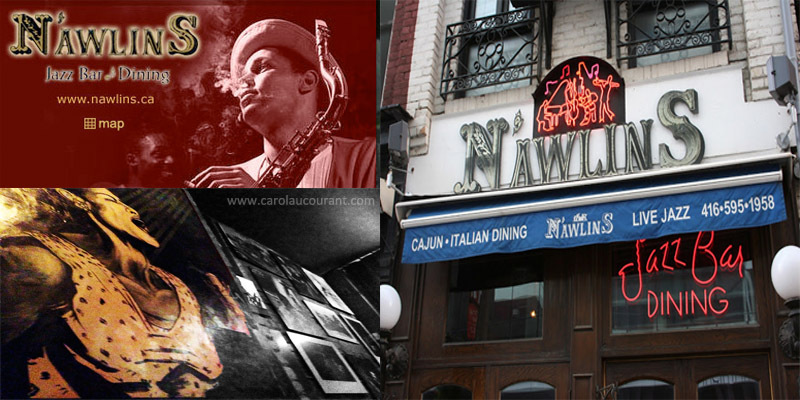 The smooth sounds of Louis Armstrong or Billie Holiday rippling off the brick walls, the luminosity from the candles off of each wooden table in the dimly lit environment and the tantalizing scent of authentic cajun food filling the air, walking into N’awlins Jazz Bar & Dining you would instantly find yourself transported to New Orleans. N’awlins being the way it’s meant to be said in classic New Orleans slang. When I initially heard of this restaurant and after much review-reading, although it was all positive and highly recommended, I admit I was a little skeptical. The size of the restaurant threw me off first as I wasn’t use to dining comfortably in cramped quarters and still consider it enjoyable. Also, as a lover of classic Jazz and a strong seafood aficionado, I was crossing my fingers this would not disappoint. It’s located in the bustling entertainment district of Toronto on King St West with live jazz entertainment every Tuesday – Sunday evening. They’ve been around 20 years and known to have the finest live jazz entertainment in town on top of their great service and delicious food. It was my sister-in-law’s birthday and we wanted to treat her to a dinner before she left for Madrid. Knowing she also had a fondness for jazz (Billie Holiday being her ultimate favourite — in fact her long-time nickname is “Billie”), has always wanted to visit new Orleans and also a big fan of seafood, we thought this was very fitting. From the first point of contact when making reservations to the very end of our dining experience in N’awlins, I was absolutely blown away with the service I received. It was wonderful and they were all very accommodating. The restaurant is long and narrow (which is very common for most restaurants on the King West strip) but very charming with print canvases of familiar faced Jazz artists sprawled across the brick walls, very dimly lit with candles atop each table, a large bar at the end of the restaurant with the live band performing in the centre. We were seated directly under the massive Billie Holiday canvas on the brick wall and were thrilled about that. We nestled into our seats and took in the wonderful atmosphere – I was immediately intrigued. That’s a mouthful coming out from me because let me tell you, I have this gift of knowing as soon as I walk into a restaurant whether or not I like it or not. 9 out of 10 times, I was right. We knew we had to try the alligator skewers since they are a delicacy in New Orleans. I’m adventurous like that. We also ordered the Peppercorn Mussels and the Bruschetta. The alligator skewers were marinated in Cajun seasoning and grilled & served with a herbed dipping sauce on top of a bed of greens at $11.50. Yum! They were good! Texture and taste in between chicken and pork. Perfectly grilled, not overly salty or greasy and it went well with the sauce. You’ve got to try it! The Peppercorn Mussels was my favourite appetizer. A ½ pound of P.E.I. mussels sautéed with leeks, garlic & green peppercorns in a light white wine cream sauce at $12.00. The mussels were cooked perfectly in a creamy white wine sauce sprinkled with the perfect amount of pepper. The waitress also provided some freshly baked french bread on the side and it paired so nicely with this dish for dipping into the sauce – I really loved it! Next time I’m here, I’m not sharing. It was that good. The list of drinks were great too and the martini’s all had a special name, named after a famous jazz artist. 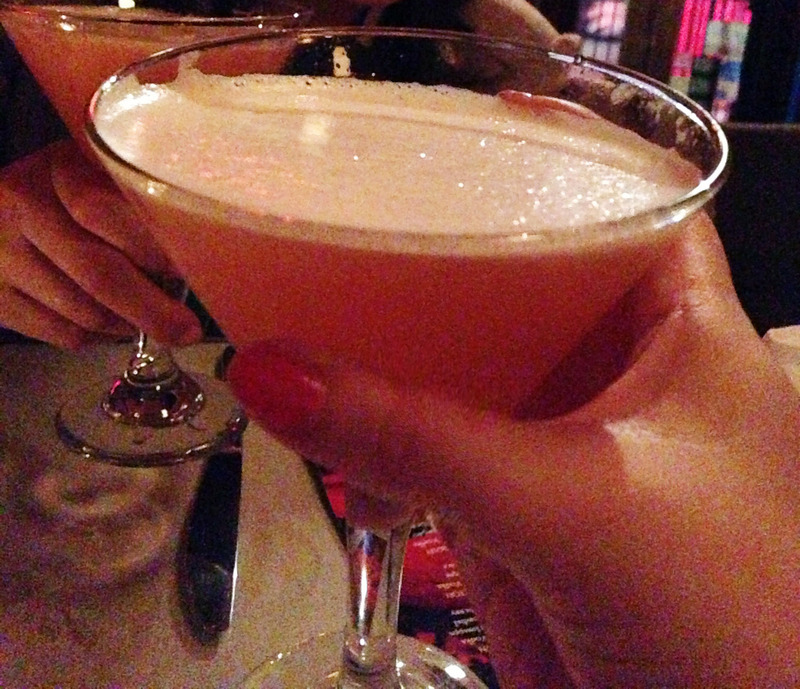 It just so happens both my sister-in-law and I went with none other than ‘The Billie Holiday’ martini. For the main course, I ordered the Seafood Medley which was an enticing combination of Cajun calamari, Cajun tiger shrimp, blackened scallops and a lobster tail served on a bed of jambalaya rice with grilled peppers at $34.00. The seafood was all perfectly grilled (nothing was fried which made it even better!) and spiced fittingly. There were some moments I would take a bite and it would pack a punch but not so bad at all. The jambalaya rice was great with the fish – I was definitely in seafood heaven. If you’re a seafood lover like me, I recommend trying the seafood medley. What I love the most about their dishes is that they are very generous with their portions, so you are getting so much for what you are paying for. And the staff was very attentive with quick service. Our waitress even took our request to have the band sing a special jazzy rendition of Happy Birthday to my sister-in-law (which threw her by surprise in a good way) sung by the amazing All Star Bourbon Street Band and a delectable cake slice of chocolatey delight complete with a lit candle. I was hoping The All Star Bourbon Street Band came equipped with CD’s because they were unbelievably incredible! They played and sang classic favourites from “How Sweet it is To Be Loved You” (which got everyone including our table singing and clapping),”My Girl” to “Sitting on The Dock of The Bay” – they really rocked the house, or shall I say “jazzed the house”. They music was not overly loud and annoying to the ears especially considering the tight space; it was just perfect! Couples danced around us, others clapped and sang along – I loved it! What a great group we had in the restaurant that night. If it’s like this every evening in N’awlins, even better. Overall, the experience was pleasant; all our sensations were satisfied and N’awlins Jazz Bar & Dining has definitely made it into our special “list”. Expect to see me there again soon! Wow, sounds like an extraordinary experience! !